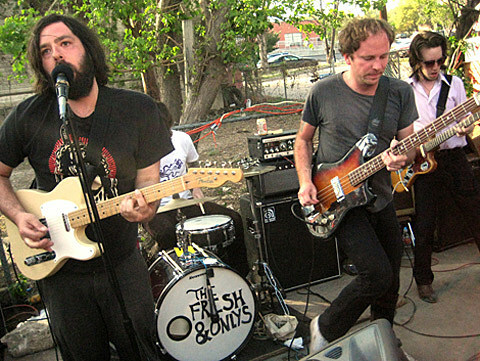 In 2009, Castle Face released The Fresh & Onlys‘ debut album, one of two they’d release that year. It was culled from dozens of songs Tim Cohen and Shayde Sartin recorded (with help from Wymond Miles) in off-hours from their jobs at Amoeba Records in San Francisco. There were lots of leftover songs and now Castle Face is putting out Early Years Anthology which gives us another look into that very prolific first year of the band. You can stream “Sunglasses” from it (via Stereogum), below. A beeramid of cheap cans, endless dope smokery and a pretty strong vibe of dudes who would play together into oblivion. Unaccredited infinite times on records that were made better by his finely crafted skills. I can pick him out on records instantly. Wymond always had the riff that made the jets of the song take off. Early Years Anthology will be out August 31, and Castle Face is also repressing their debut album which has been out of print for a while now.